Swami Jyotir Maya Nanda was born on Feb. 3rd, 1931 in a pious family in Dumari Buzurg, district Saran, Bihar, a province sanctified by the great Lord Buddha and his holy associations. From his very childhood days he evinced various marks of his future saintliness. He was calm and reflective, brilliant in his work at school and college, loved by his friends and relative. Always a source of inspiration to all who came in contact with him, he never faltered in his high ethical ideals. Side by side with his higher studies and duties of a practical nature, he reflected upon the deeper problems of life. The overwhelming feeling to serve humanity through spiritual life led him to embrace the ancient order of Sanyasa on Feb. 3rd, 1953 at the age of 22. Tirelessly he practiced intense austerities, living in the Himalayan retreats by the sacred Ganges River. 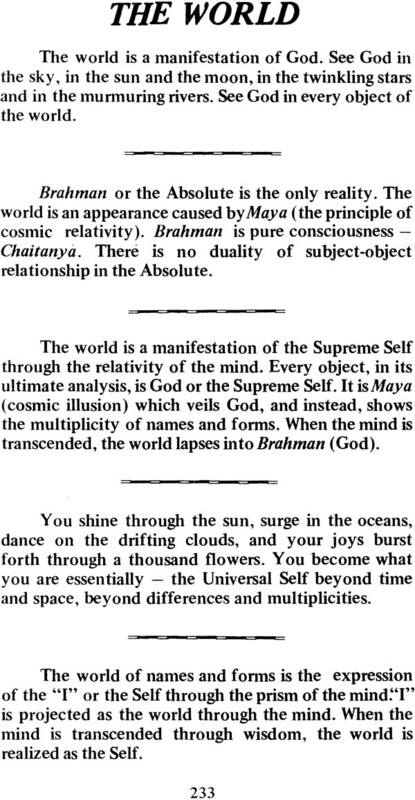 For over 9 years he was a religious professor at the Yoga Vedanta Forest Academy, giving lectures on the Upanishads, Yoga Vasistha, Raja Yoga, and the other important scriptures of India. 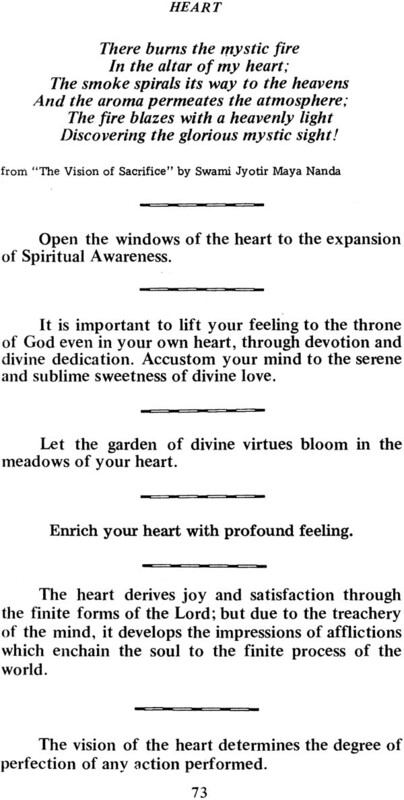 Beside this teaching, he was the Editor of Yoga Vedanta Journal. To his Guru, Sri Swami Sivanandaji Maharaja, Swami Jyotir Maya Nanda was a gem, ever able to assist foreign students in their understanding of Yoga and Vedanta. His intuitive perception of their problems endeared him to all. His exemplary life, great command of spiritual knowledge, love towards all beings, and his very impressive and dynamic exposition of Yoga and Vedanta Philosophy attracted enormous interest all over India, and in different countries of the world. He frequently lectured by invitation at All India Vedanta Conferences in Delhi, Amritsar, Ludhiana, and other parts of India. After many requests, he consented to come to the U.S.A. in 1962 to spread the knowledge of India. Crossing Europe, he lectured in various countries. 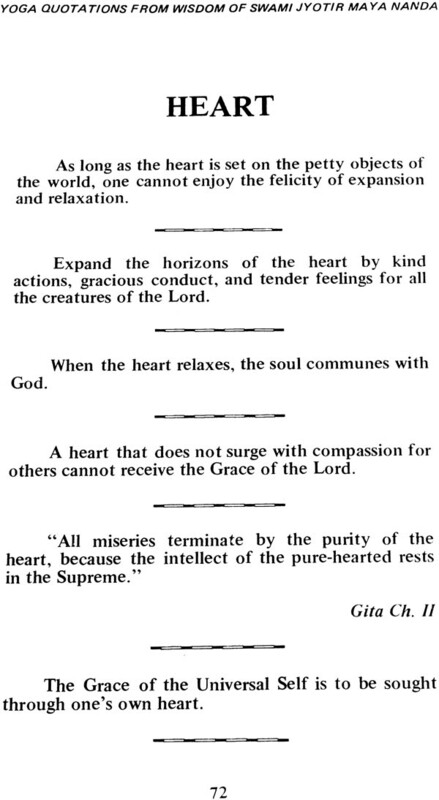 There is a development of unusual dimension in his range of richness and wisdom – he never contradicts the great scriptures of the world, but adds to them by his unique explanations. In 1964, he toured North and South America, inspiring and elevating numerous students of Yoga. “Behind his vast erudition lies a sincere and feeling heart, yearning for the upliftment of the seeker after truth,” wrote M.L. Bazaz, Secretary to the late Prime Minister Nehru of India. 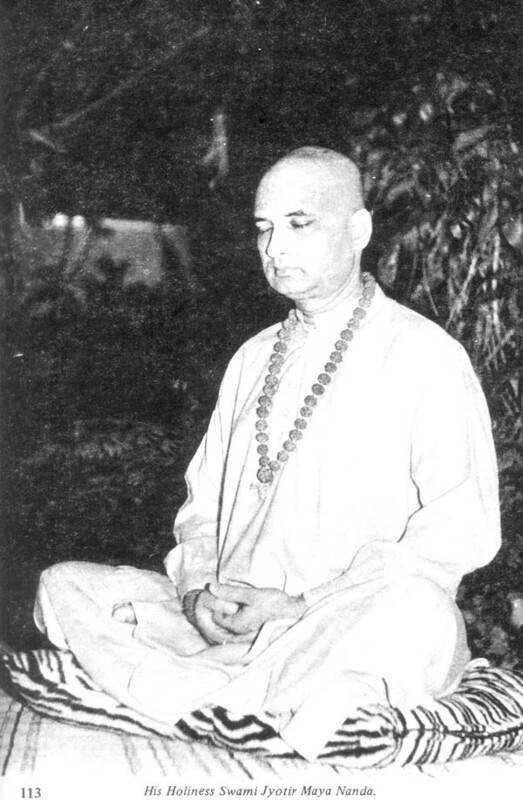 In Puerto Rico (from June 11, 1962 to 1969), as the founder of Sanatan Dharma Mandir, he rendered unique service to humanity through his regular classes, two radio lectures (one is Spanish and one in English) every week, and numerous T.V. appearances. In March of 1969, he moved his center of Miami, Florida, where he has appeared on many T.V. and radio programs, and has spoken at all nearby universities and philosophical centers. At his International Yoga Society’s main Ashram, he has regular weekly classes on Yoga Vasistha, Hatha Yoga, Mahabharata, Bhagavata Purana, and Meditation. Through his dynamic magazine, International Yoga Guide, his radiant guidance, and his ever-effulgent literature, Swami Jyotir Maya Nanda stands forth as the glowing morning sun awakening sleeping hearts to a new dawn of bliss. Swami Jyotir Maya Nanda occupies today a place of the highest order among the international men of wisdom and is acclaimed as the Genius of Yoga! 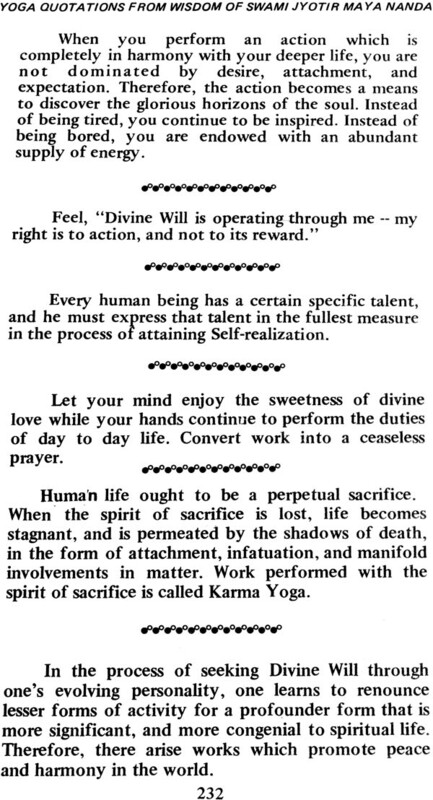 These inspiring quotations have been culled from H. H. Swami Jyotir Maya Nanda's books, magazines, poetry, class lectures, and Radio and T. V. interviews. The topics include a vast range of subjects which have been arranged in an alphabetical order for the convenience of the readers. If you want to collect your thoughts on any vital subject of life, or for the understanding of Yoga philosophy, all that you need to do is to open to that page number. You will find the most sparkling thoughts ready to help you in the best manner possible. 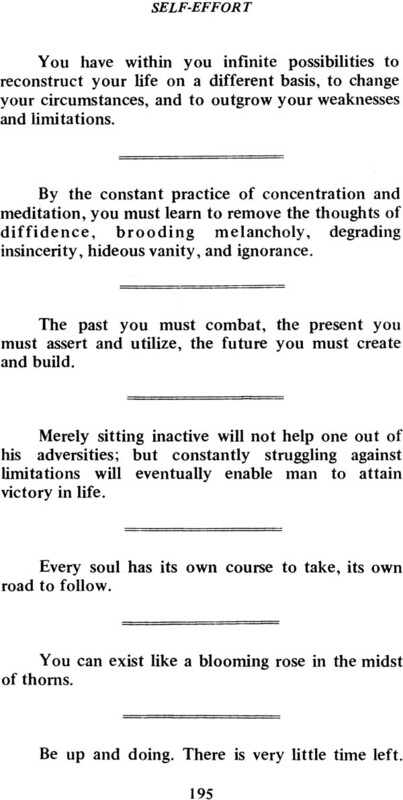 "Stagnation is death, and continuity is life. Therefore, flow on like a merry stream towards the Ocean of the Self!" 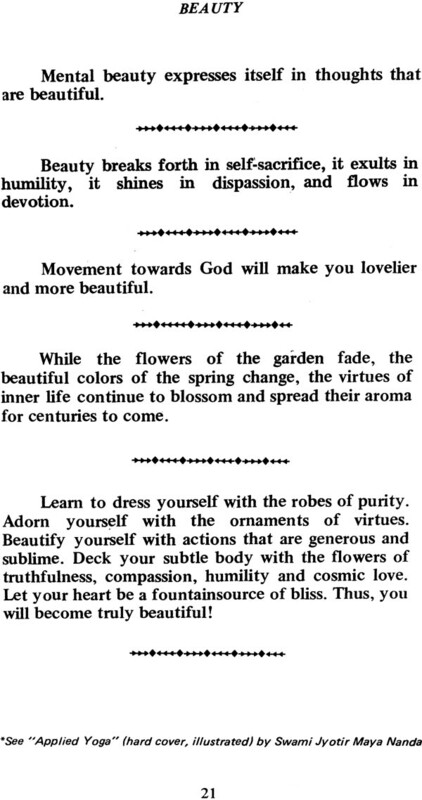 "Live a life that is rooted in God, and be decked with the blooms of virtues and the fruits of universal harmony." This is an excellent book for all Yoga students, teachers and research scholars of philosophy. It is like a garland of gems to be studied and emulated in everyday life. It forms a constant stream of Satsanga or good association, in which one must refresh oneself day by day. A great waterfall throws clear, cascading waters sparkling with sunlight into the air. 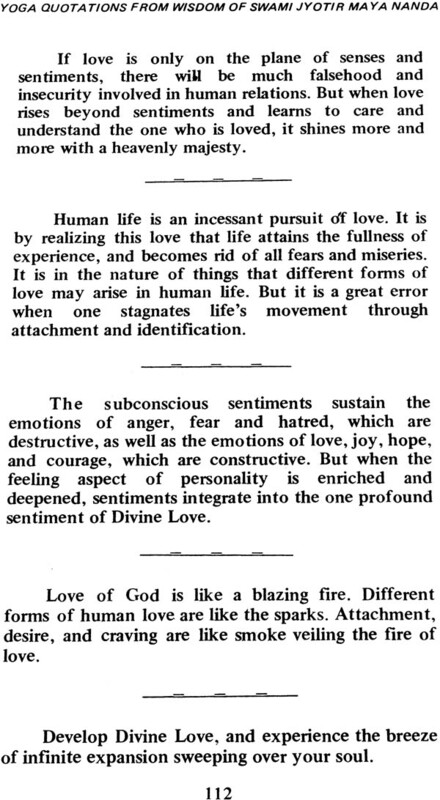 In the same way, these quotations are like cascading waters of sublime thoughts lit up with the light of wisdom proceeding from the boundless spiritual experience of Sage Swami Jyotir Maya Nanda. While teaching the art of thought culture, Sri Swami Jyotir Maya Nanda has said, "Allow your mind to linger on spiritual thoughts as a bee would linger on a blooming flower, enjoying the nectar that is contained therein. Nourish your mind with the sublime sentiments and thoughts presented by great men. Fill your mind with positive thoughts before you go to sleep. A waken positive thoughts when you wake up early in the morning. Raise the level of your thought before you take food. Be prayerful while you take a bath. Your unconscious is very receptive to positive suggestions during these moments. As you think, so you become. You can change the very fabric of your life. You are the architect of your destiny!" 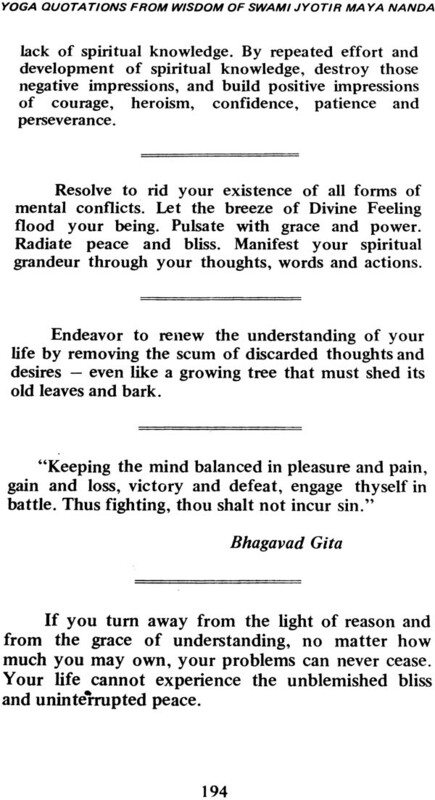 There is nothing more vital in the life of an aspirant than the practice of elevating the thoughts of the mind. 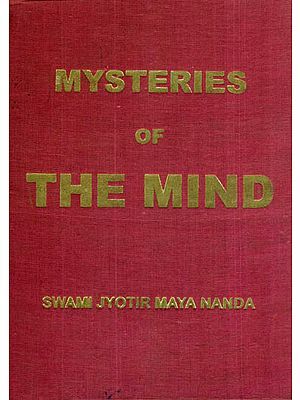 The Author, Sri Swami Jyotir Maya Nanda declares, "Thoughts of the mind are the basis of personality integration and success in life. Through pure thoughts, a person can discover the universal stream of life within himself He can attain freedom from sorrow and all limitations. But through impure thoughts of selfishness, greed, and violence, he can imprison himself in a limited life caught in the whirlpool of birth and death." 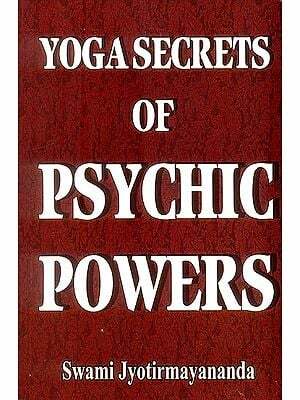 A neophyte on the path of Yoga finds himself drowning in the salty ocean of numerous Yogic teachings and voluminous books of spiritual wisdom. He is easily confused because of various conflicting ideas and thoughts presented in the vast literature of scriptural teachings. This present book is like a stream of sweet water which contains the essence of all great teachings. 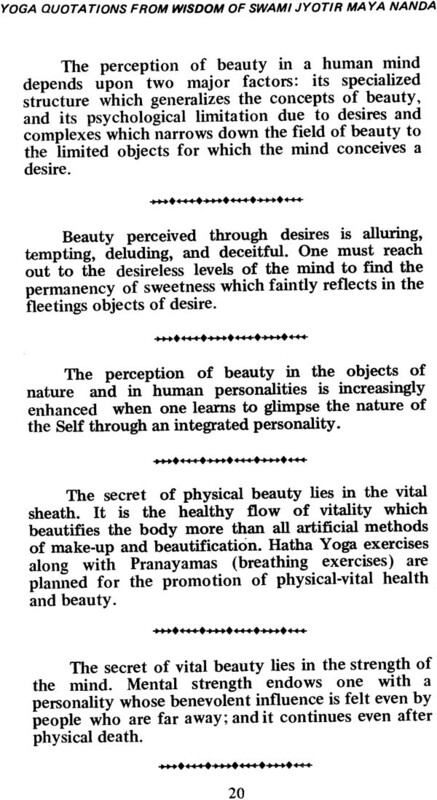 As you continue to read and reflect upon these magnificent quotations, you will gain deep insight into all aspects of Yoga, as well as into the mysteries of life. You will develop a balanced personality and will advance on the path of Yoga in its integral form. Our profound appreciation to the staff of Ashram Karma Yogis who have rendered their assistance in the various aspects of the completion of this book. May your life be illumined with the golden rays of wisdom!